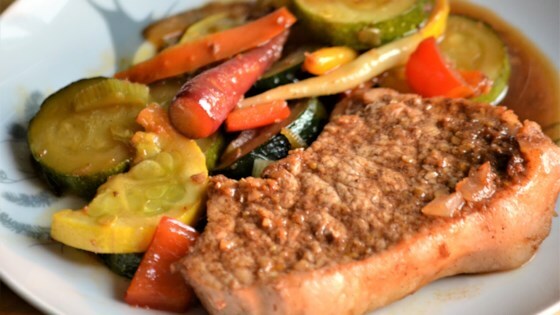 "Spicy honey Asian chops with vegetables. No additional salt is needed because the soy sauce is enough to salt the whole casserole. However, you can add soy sauce to adjust the level of saltiness desired. Serve with white boiled rice to get a complete meal." Mix together 1 tablespoon vegetable oil, ginger, garlic, paprika, cinnamon, orange zest, cloves, and cardamom in a bowl to form a paste and rub the pork chops with the spice paste. Heat 2 tablespoons vegetable oil in a large deep skillet and pan-fry the chops over high heat until browned and no longer pink inside, about 10 minutes per side. Pour in 1/4 cup soy sauce and coat the chops with soy sauce. Pour in honey, remaining 1/4 cup soy sauce, and water; mix thoroughly. Reduce heat to medium. Stir in zucchinis, carrots, onion, green bell pepper, and celery; cook and stir vegetables until cooked through but still slightly firm, about 10 more minutes.